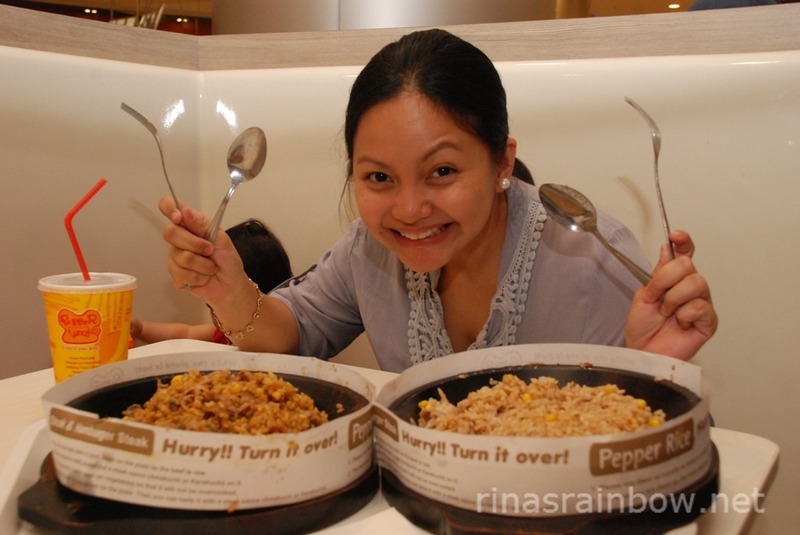 I love Pepper Lunch. Any chance I get to go there, I would. Any chance that Richie gets to go there without me, he's dead. Hehehehe. 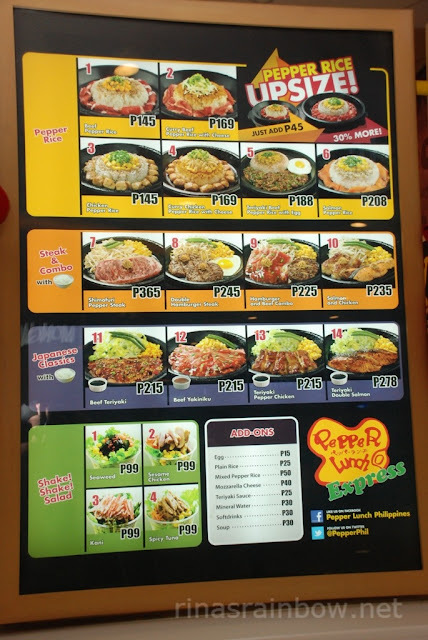 One fine Sunday, my little family and I went to Robinsons Magnolia and was thrilled to see they had Pepper Lunch Express in their food court. Richie didn't have to twist my arm when he said to try the Express version. The express menu doesn't have as much items compared to their normal menu. 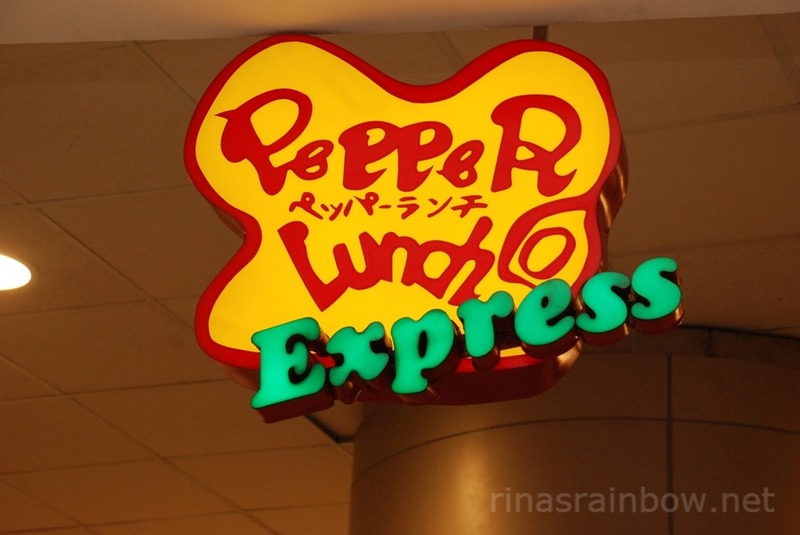 But for me, as long as they have their signature Beef Pepper Lunch, I'm okay. That's my all-time favorite! I never get tired of ordering that. (I love their Beef Yakiniku too!) 14 items is still a lot if you think about it. They have this electronic claim number thingy that lights up and buzzes as soon as your order is ready. I ordered my favorite Beef Pepper Rice while Richie ordered the hot dish of that month, the Burabata Yakiniku Pepper Lunch a.k.a. Pork Belly Yakiniku. And then he added Mozzerela Cheese for only P45. Genius! Extra cheese is extra good! 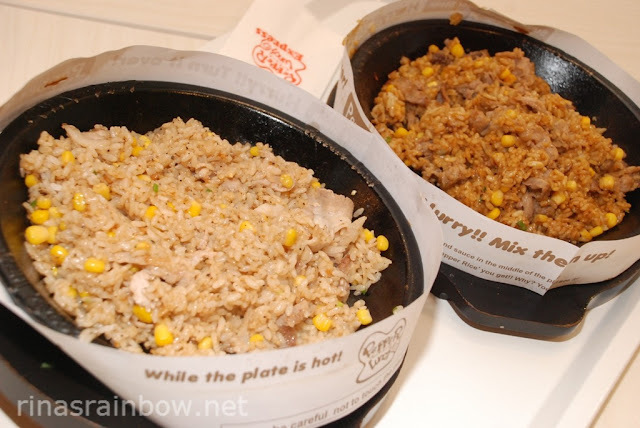 As soon as Richie came back with our order, I noticed they didn't have the special honey brown sauce (Amakuchi) and garlic soy sauce (Karakuchi). On the normal Pepper Lunch stores, they're already pre-set on each table. But this was a food court. So of course they wouldn't leave their special sauce bottles on the food court tables. Richie said he didn't see any sauce bottles on the counter. I was nearly heart-broken. 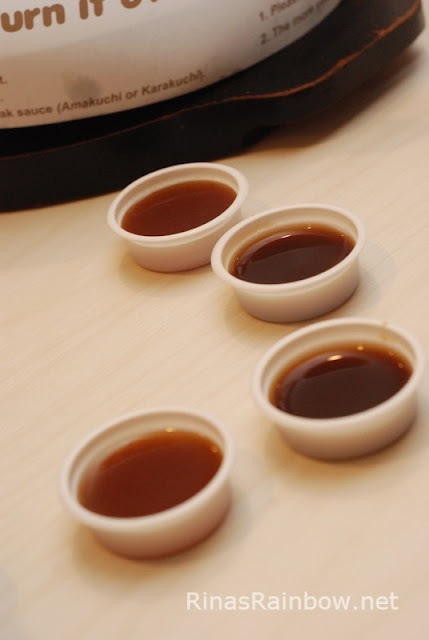 The extra sauces were the essence of the experience! I love my pepper rice sweet and salty. I marched right to the counter. I wouldn't have it! I was going to ask for extra no matter what. But as soon as I got there, I saw that there were bottles at the end of the line with little plastic sauce cups to put them in. I was so relieved! (Again, a classic case of Richie not looking hard enough hehe). Richie with his game face on! 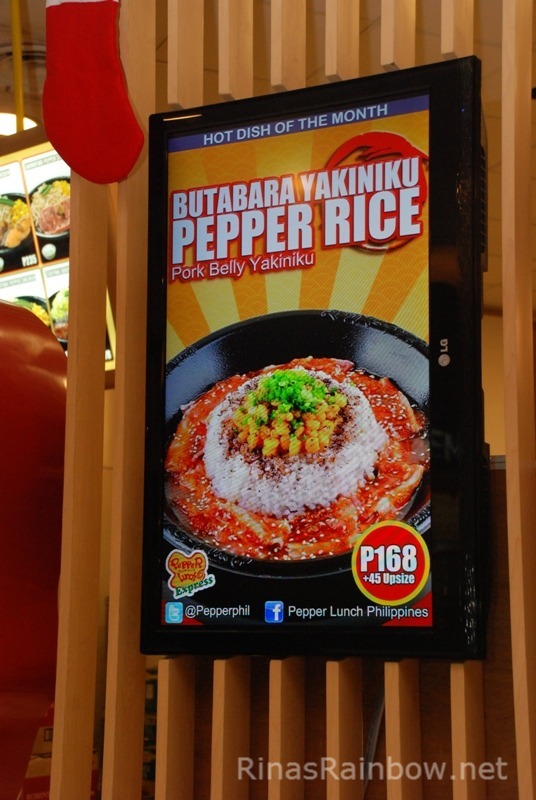 Rain, meet Beef Pepper Rice! 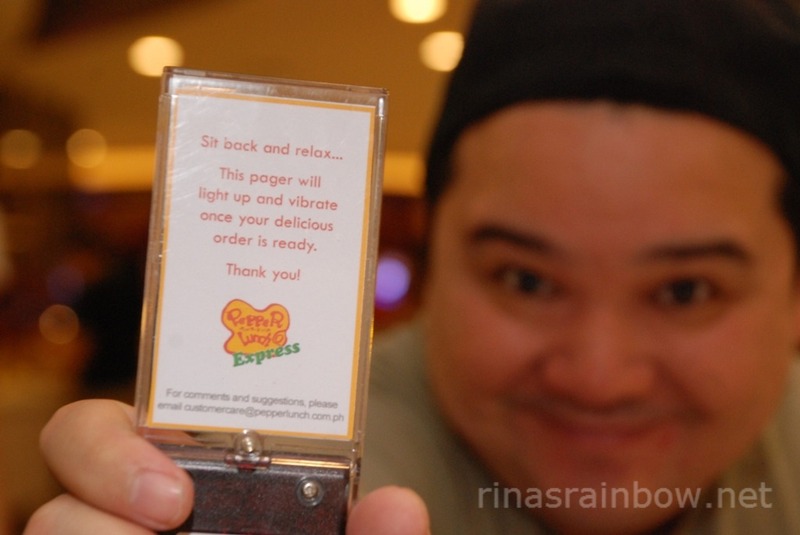 All in all I was satisfied with our Pepper Lunch Express experience. 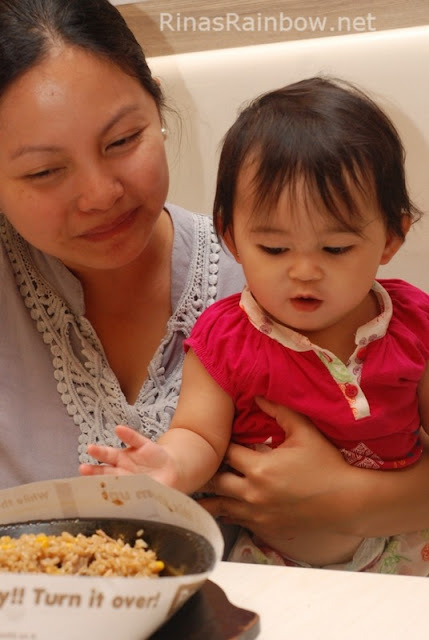 Their menu is not as extensive but the basics are there, and more! I haven't tried Pepper Lunch. :( Must go soon!!! Seriously???? 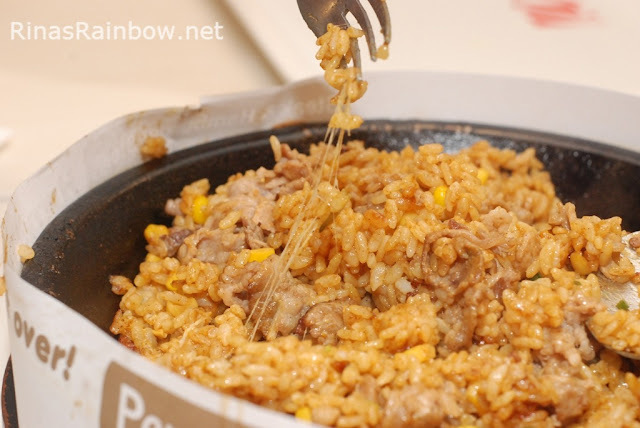 If you love flavored rice and meat that is sliced like bacon, you will love this! Good thing that baby Rain was behave the whole time. Masarap ang kainan..
Pareho tayo! 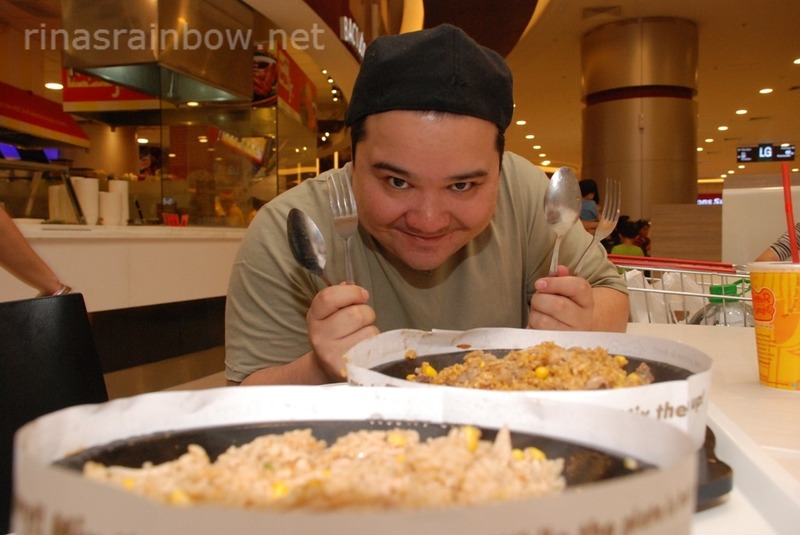 I always order beef pepper rice! I love the simplicity of it kasi eh :-) It's like a healthier bacon hahaha! beef kasi hehehe :-) #WhateverHelpsMeSleepAtNight hahaha! Bouncing on the trampoline is fun but buying high bounce trampoline is full of fun.